10th-36th BCS English Literature Question Solve found here. 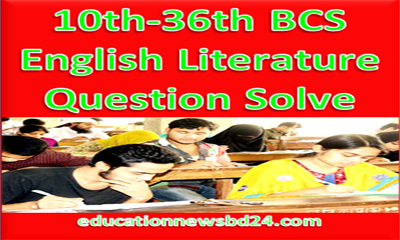 BCS English Literature from 10th to 36th BCS Complete Question Solve found here. 15 Marks common question comes from English Literature in every BCS Exam. Besides this, any kinds of exam regarding PSC, Bankers Recruitment, NTRCA Teacher Registration and various Government, Non-Government service exam or English Part of Varsity admission exam comes from “English Literature”. 10th-36th BCS English Literature Question Solve with Vast Explanation will help you for better preparation of any of the next year BCS exam.